The Dell Ultrasharp U2715H is a good IPS LCD monitor with wide viewing angles and a 1440p resolution that make it very suitable for productivity-oriented environments. Its flexible and easy to use stand makes setting up and sharing your screen a bliss, and its colors are quite accurate thanks to a factory calibration.  Unfortunately, its blacks aren't the most uniform and show signs of glow, and it doesn't offer higher refresh rates for better motion. 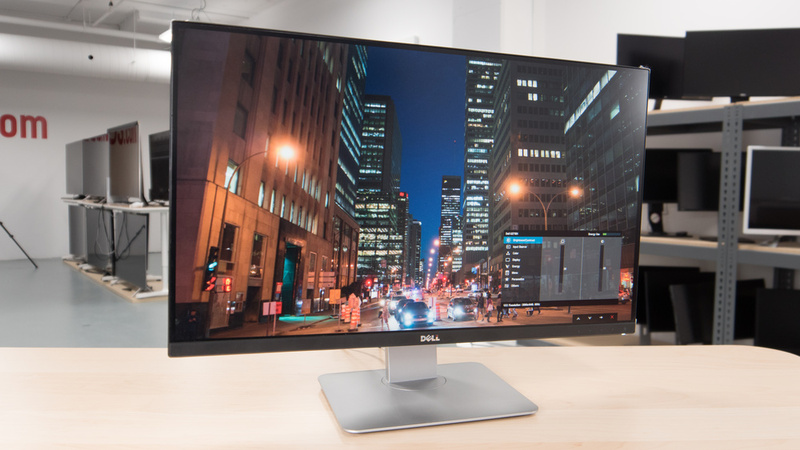 This Dell Ultrasharp U2715H monitor has the familiar Dell aesthetics, which is great. The stand has a small footprint but still feels stable and supports the monitor well, with ergonomic options to tilt, swivel and adjust the height easily. 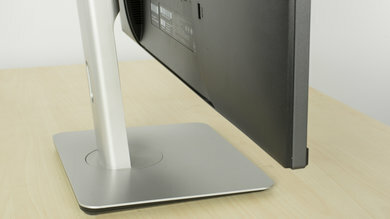 It also has a quick-release VESA mount which makes it simple to attach to another stand or move easily. 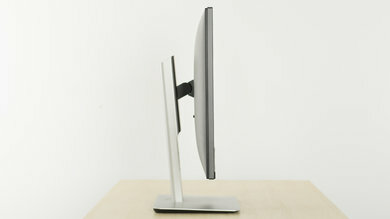 The rear of the monitor is also simple,but looks professional. As with other Dell monitors, the build quality is good. 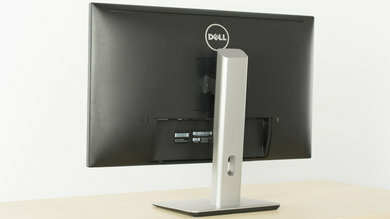 The stand of the Dell Ultrasharp U2715H is very similar to other Dell monitors, with a small rectangular footprint. It feels stable and provides good support. This Dell U2715 monitor has a wide range of ergonomic adjustments, making it easy to adapt to any setup or space. The height adjustment range is good, and the monitor can easily be rotated to portrait. The rear of the Dell Ultrasharp U2715H monitor is simple but looks professional. 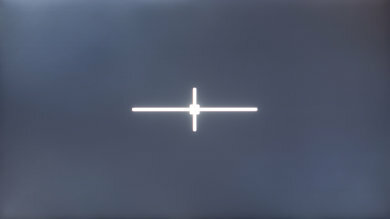 All of the inputs are located on the back of the monitor. The borders are quite thin and look good. 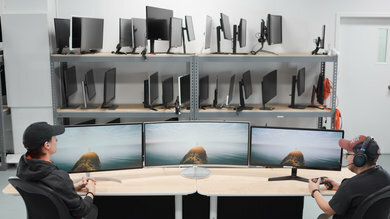 When placed together in a multi-screen setup, there is only a small gap between each display. 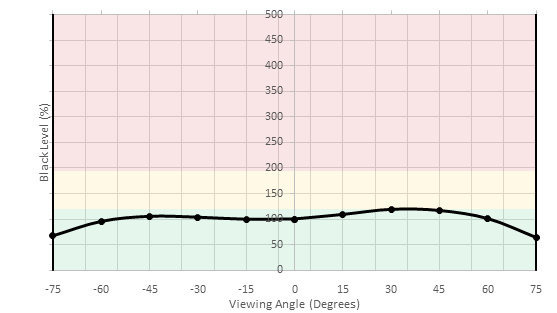 The monitor has an average thickness. If placed on a VESA mount, it doesn't stick out too much and still looks quite good from the side. The build quality of this Dell monitor is good. Although it is almost entirely plastic, it still feels high quality and the design is well-refined. 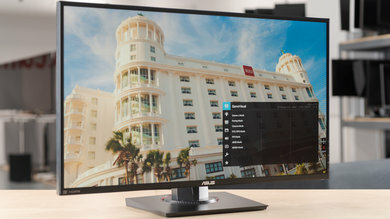 The Dell U2715H IPS monitors have an average picture quality. 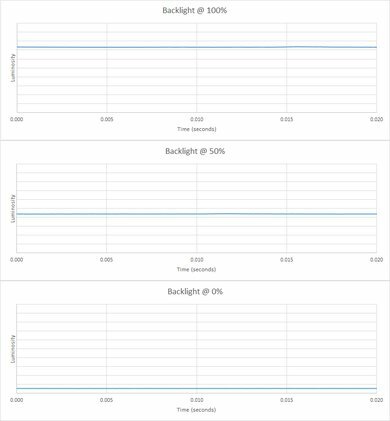 When set in a dark room, the below average contrast ratio and the poor black uniformity make for an ordinary performance, especially if you are watching multimedia content with a lot of dark scenes. 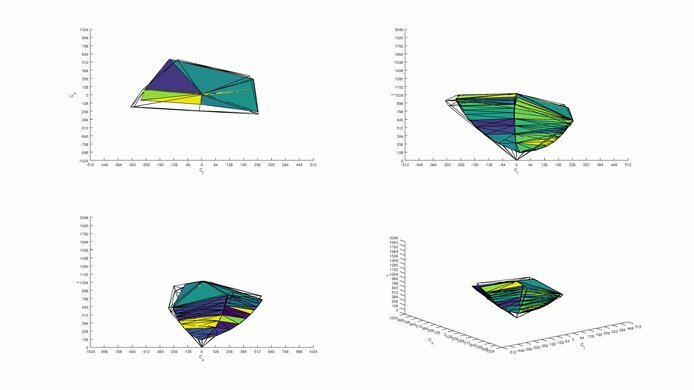 The monitor does much better when used in a brighter environment like an office space, as it has a great SDR peak brightness and good reflection handling which help fight glare from a close lamp or even a bright window. 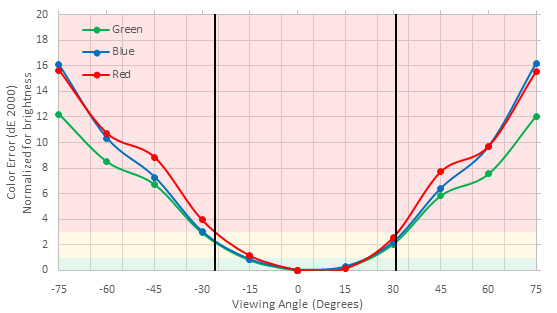 Color accuracy is good out of the box and remains good even when viewing the monitor at a sharp angle. 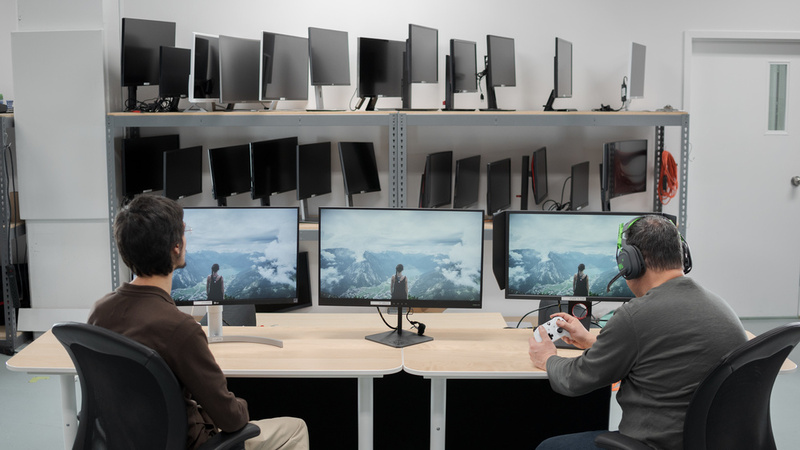 The monitor is pretty simple though and does not have more advanced features like HDR and local dimming, but overall is still a very good option for office work (see our recommendations for the best work monitors) and even for gaming. 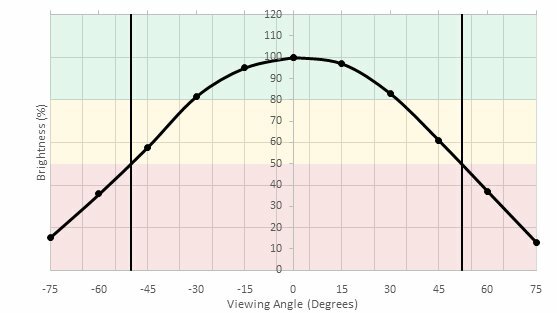 The monitor has a below average contrast ratio but is rather good for an IPS monitor, which always have a much lower contrast ratio than VA panel monitor or TV. The negative effect of a low contrast ratio will show up when the monitor is used in a dark environment, as blacks will look more gray than really black. Fortunately, if the monitor is used in a well-lit environment, like an office space, this negative effect is noticeable, as the ambient enhances perceived black level. 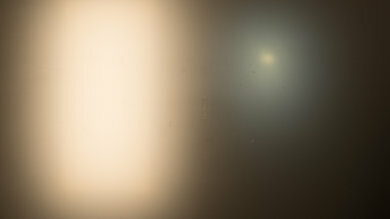 The Dell U2715H monitor does not have a local dimming feature. The video is for reference only. Great SDR peak brightness. The Dell U2715H gets bright enough to accommodate for even more challenging environments. It does not change brightness over time or with different content shown on screen. Good horizontal viewing angle. Thanks to its use of an IPS panel type, the monitor maintains its black level even from very steep angles. 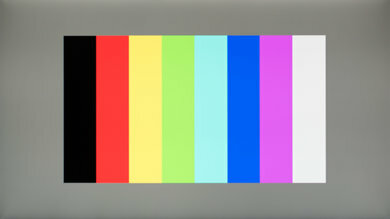 Colors also remain accurate enough for the monitor to be easily shared with people to the sides. 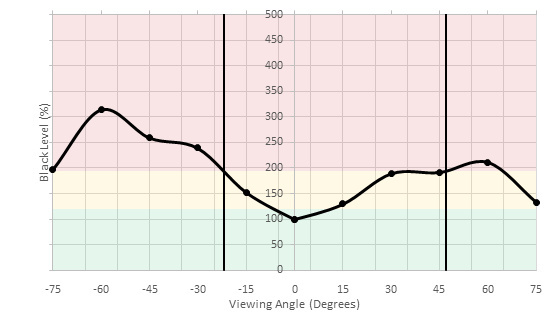 Decent vertical viewing angle for the Dell Ultrasharp U2715H. Colors and brightness are retained relatively well at an angle. 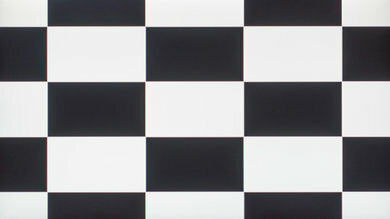 Blacks, however, shift significantly more vertically than horizontally, causing part of the uniformity issues seen in the black uniformity test (IPS Glow). 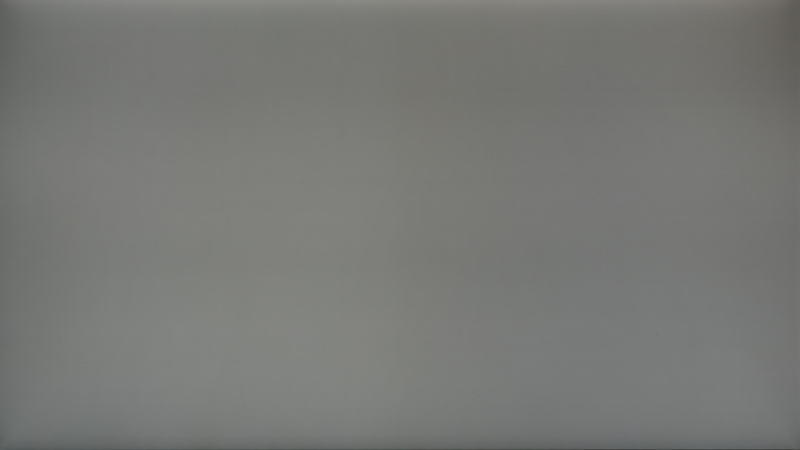 The overall gray uniformity of the Dell U2715H monitor is impressive. 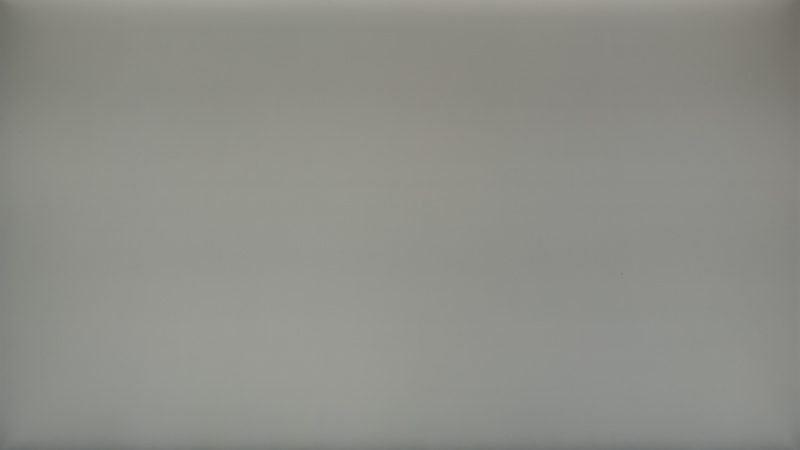 Looking at the 50% gray test uniformity picture, we can see a faint darker horizontal line near the center of the screen, but luckily it did not show up too much while looking at normal content.  The rest of the uniformity issues (darker corners and brighter top edge) are almost all located on the edge of the panel itself, and thus dirty screen effect is not a problem here. Looking at our 5% gray, the only visible problem that we can notice is the upper left corner that is a bit brighter than the rest of the screen, and this is also the same spot that has some flashlighting visible on our black uniformity test. 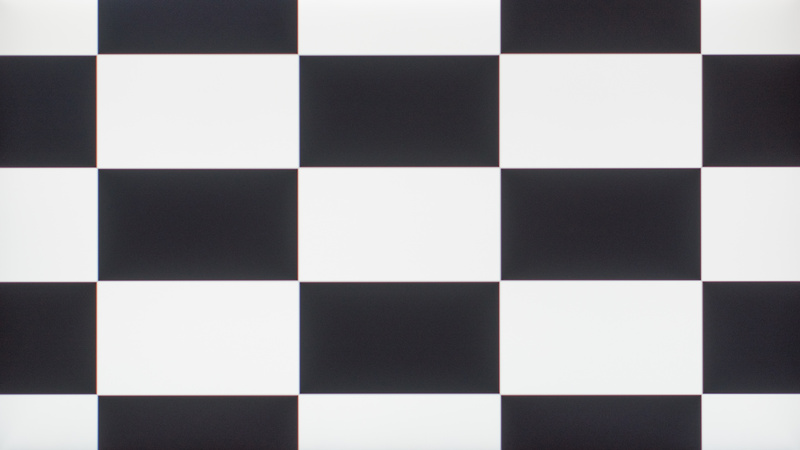 The black uniformity is poor. 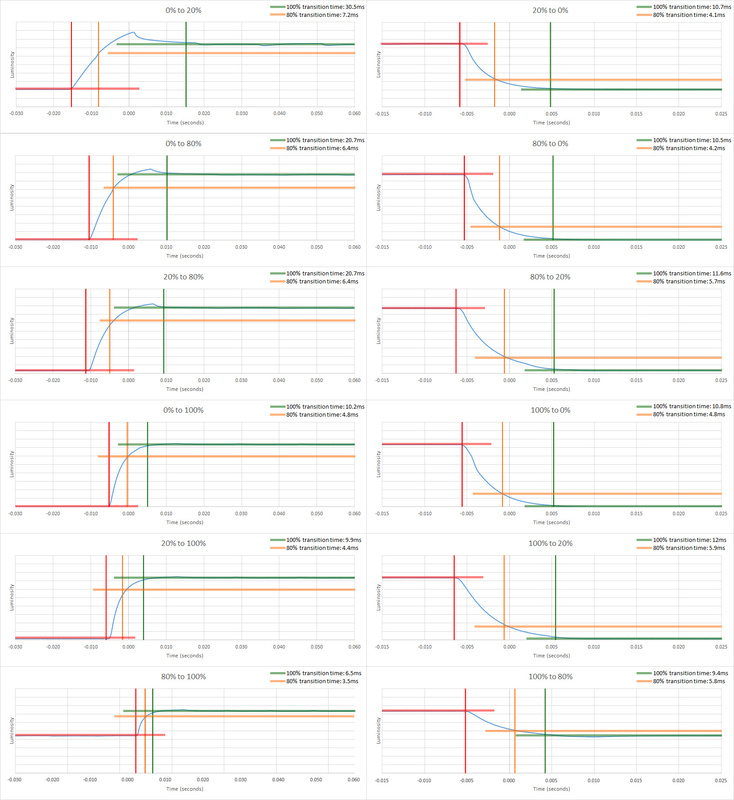 Unfortunately, this is in line with most IPS monitors we have tested. Flashlighting (backlight bleed) is visible near all corners, with the top left corner being the worst. This is visible as blotchy dark images when viewed in a dark room. 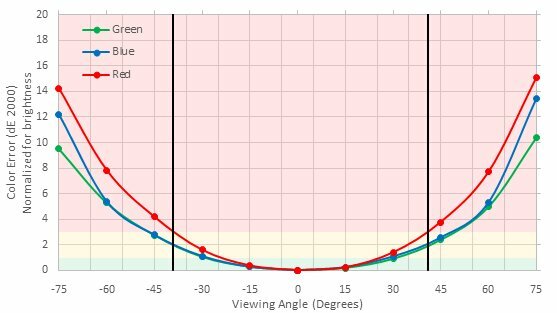 Out of the box, the accuracy of the Dell U2725H monitor is better than average when set on the most accurate picture mode, which was the 'Custom Color' picture mode. 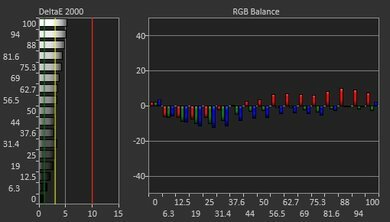 The color temperature was a bit warmer than our desired 6500K color temperature and this is reflected in our white balance reading, as the monitor is missing a lot of blue in the lighter grayscale shade. 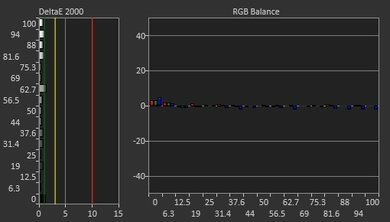 The White balance dE is still pretty reasonable though at 2.71, which is under the level of inaccuracy that most enthusiasts would notice. 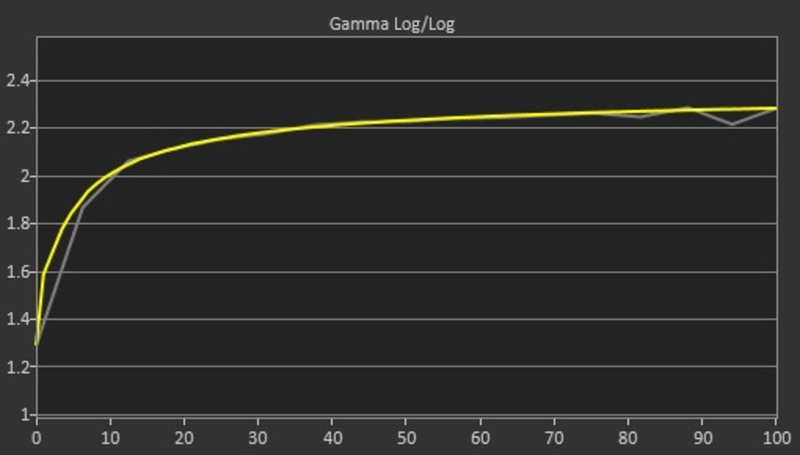 As for the gamma, the overall value is not far from our 2.2 target, but the curve does go off target in the darker shade of gray. 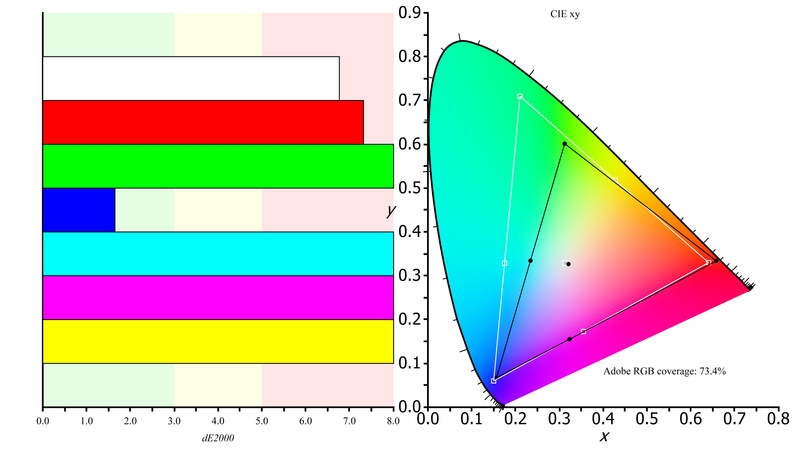 The color accuracy of the monitor, which a dE of 3.48, is a bit off, as it would be noticeable to an enthusiast. Not color in particular are really problematic though. 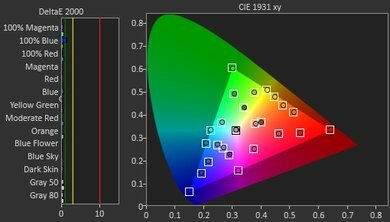 After calibration, which was also done on the 'Custom Color' mode, as it is in this mode that we have the full control on the internal RGB cuts/gains controls, the accuracy of the Dell U2715 is excellent. The color temperature is much closer to our desired 6500K, and both the color dE and the white balance dE are well under what anybody, even professional could notice. 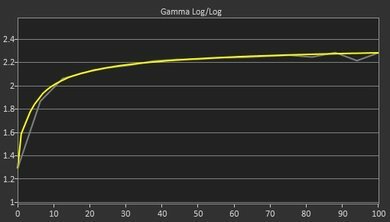 The gamma is a bit closer to our 2.2 target, and the curve track more closely our target curve, where the big derivations are now corrected. 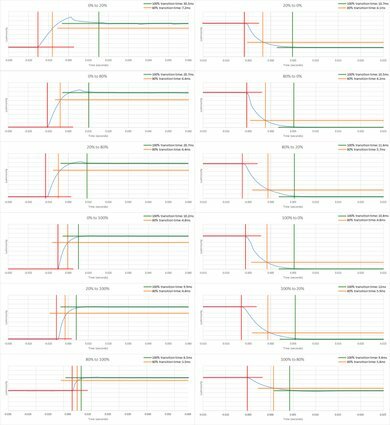 Excellent coverage of the s.RGB (rec. 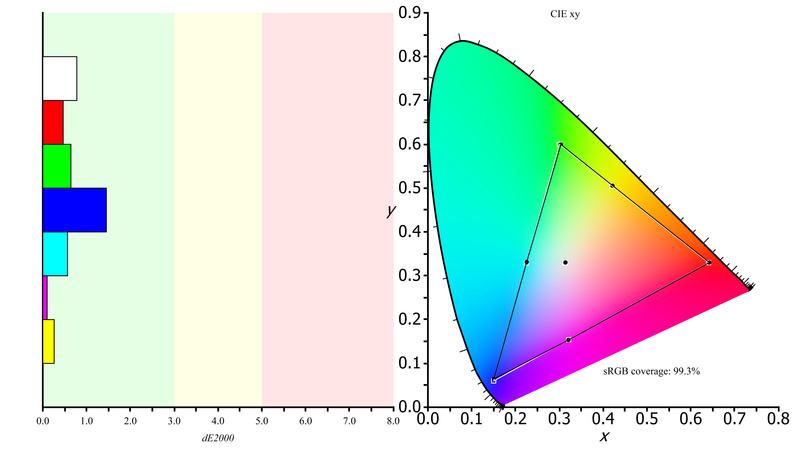 709) color gamut. The Dell U2715H's better than average factory calibration allows it to track the s.RGB color space very accurately giving it an almost perfect reproduction. Unfortunately, it does not actively support the professionally oriented Adobe RGB color space, making it less useful for applications that require it. Excellent SDR color volume. The Dell U2715H's relatively accurate out of the box color mapping means it has no issues covering the s.RGB color volume. It only sees issues in darker tones due to its relatively low contrast ratio. Its coverage of Adobe RGB is passable, but not suitable for more professional users that require that color space. HDR color gamuts are not supported. The monitor does not suffer from image retention, which is an excellent new for an IPS monitors. The Dell U2715H has a great performance when displaying our gradient test image. 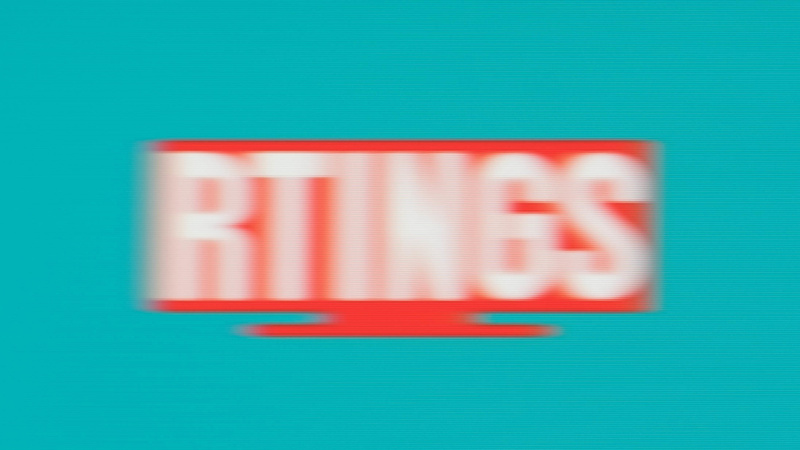 The 8-bit banding is visible, but besides it, not many issues can be noticed. 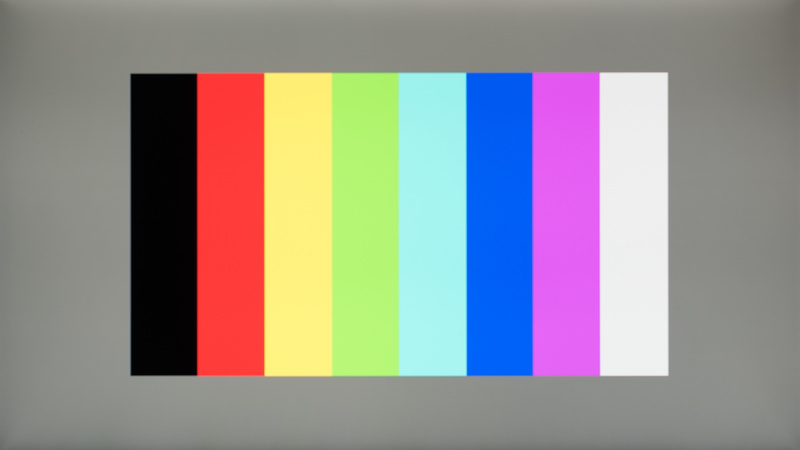 Some little issues are visible in the darker shade of color, but banding it not problematic white watching normal content. 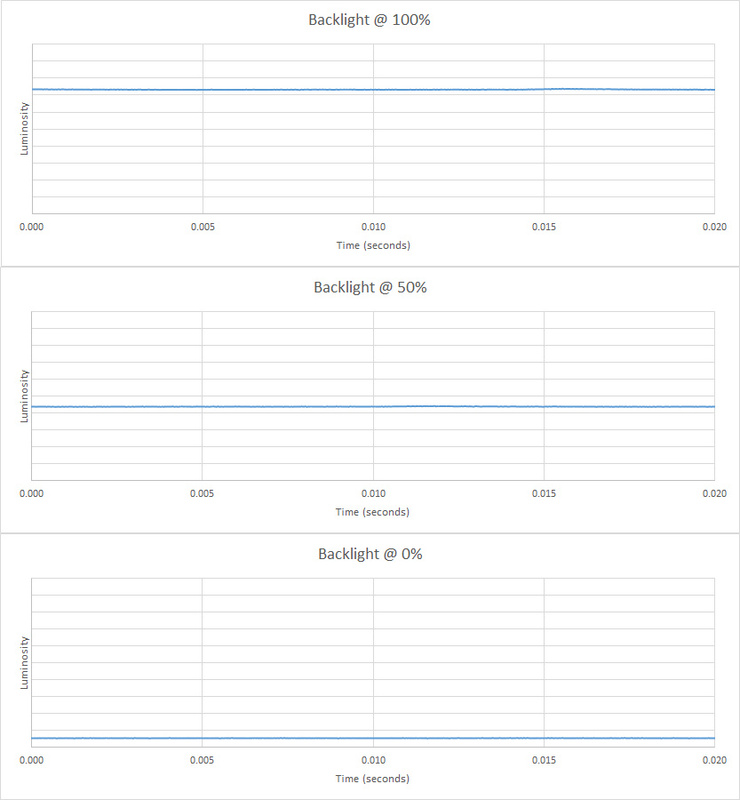 The Dell Ultrasharp U2715H does great in our color bleed test and shows insignificant amounts of error. 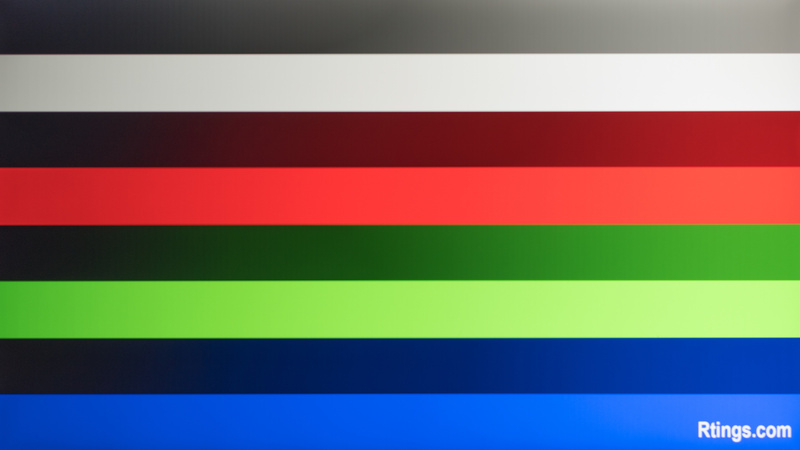 This means that large patches of color won't have distracting stripes extending across the display where they aren't supposed to appear. The reflection handling is good. 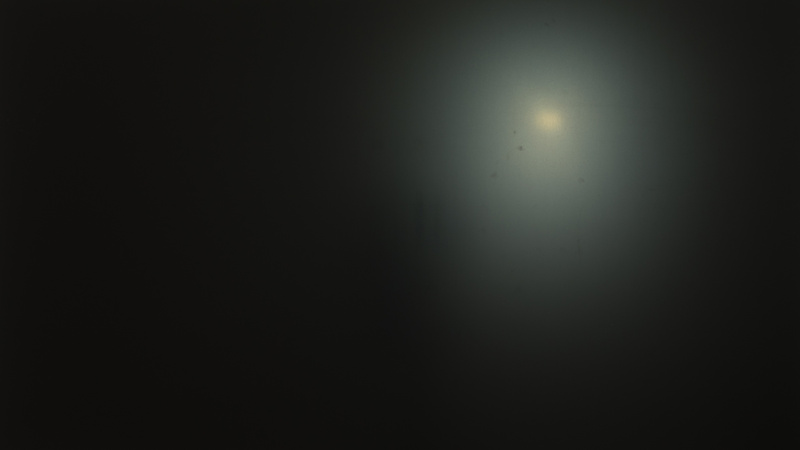 The semi-gloss finish diffuses specular reflections across the screen, reducing their intensity. This is good for most environments, but may be an issue in a bright room. Motion looks decent on the Dell Ultrasharp U2715H, but not as good as on many gaming monitors. While the monitor has great pixel response time and a flicker-free backlight, its fixed 60 Hz refresh rate is fairly limiting for serious gaming. Great response time, good enough for watching fast moving content such as playing video games. Only a short trail can be seen following our moving logo; most of the blur in the photo is due to persistence as an object is followed past a static frame. Smearing is unlikely to be an issue, which is great. The 'Response Time Fast' setting is a little faster than the default 'Normal' but introduces visible overshoot. However, some people who are not bothered by overshoot may prefer it. The backlight is dimmed without using any PWM flickering, which is great and produces smooth motion.  Unfortunately, there is no option to add flicker using black frame insertion, which would reduce blur further. 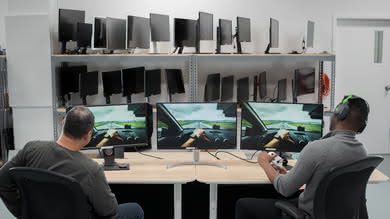 This isn't that bad though, as many people find 60Hz flicker distracting. This is a simple 60 Hz monitor without any higher refresh rates or variable refresh rate options. This is fine for most use cases, but for gaming, this limited refresh rate will be a hindrance. The Dell Ultrasharp U2715H has a very good QHD resolution and fairly large 27" size, which are great for most usages. 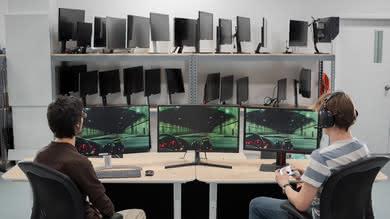 It also has great low input lag, which will please all but the most competitive gamers. 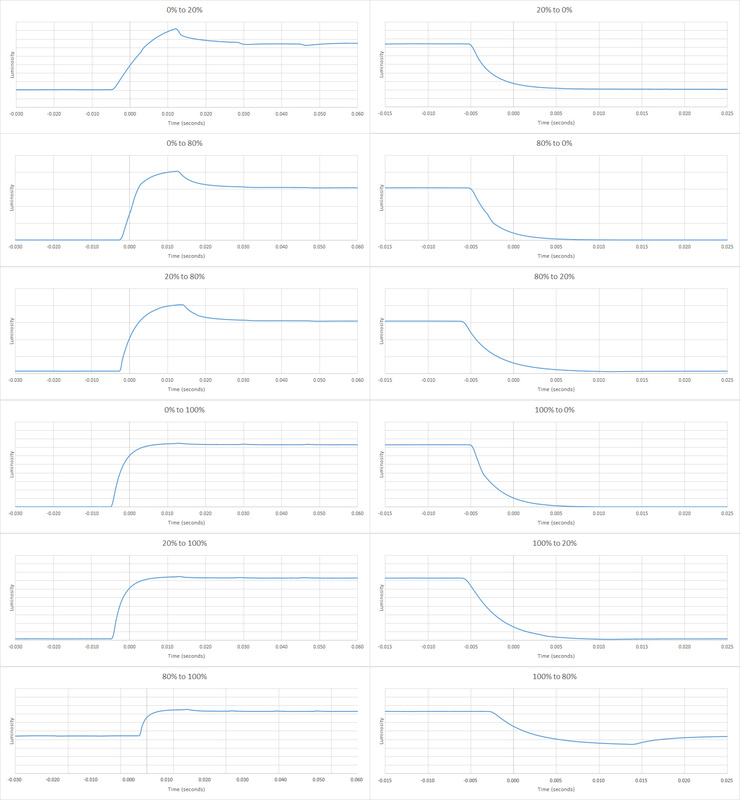 Great low input lag for the Dell Ultrasharp U2715H, which should please all but the most competitive gamers. 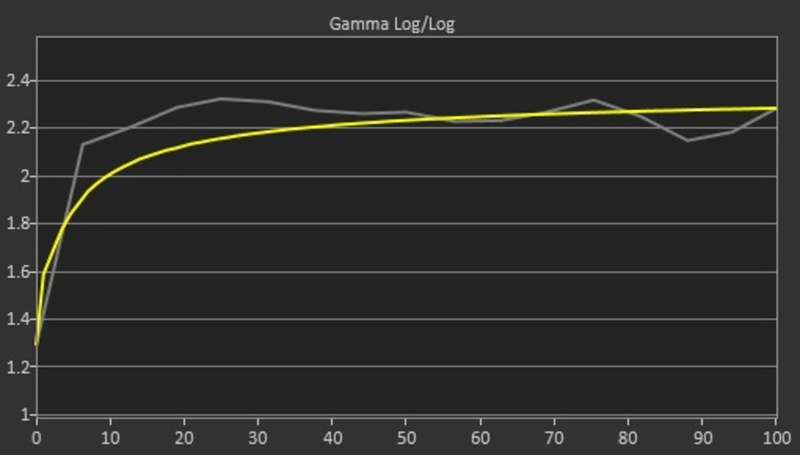 The input lag is constant no matter the input resolution, which is handy when gaming at lower resolutions like 1080p. The Dell U2715H has a very good QHD native resolution and a fairly large 27" size, which are great for almost all usages. 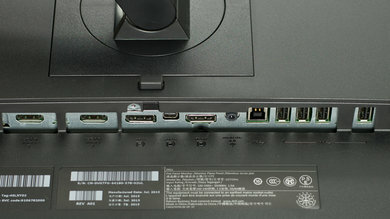 All the inputs are on the back of the monitor. 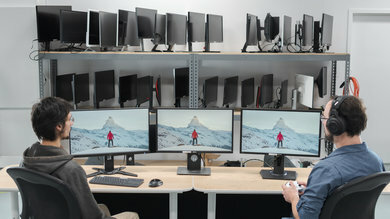 The Dell Ultrasharp U2715H has a DisplayPort Out for daisy chaining with another monitor, so both monitors can be fed using only one DisplayPort out from the computer. The Dell Ultrasharp U2715H has all the standard features of a monitor such as adjustable overdrive, image and color settings, all arranged in a well laid out on-screen display menu. It also has a DisplayPort Out so it can be used to drive a second monitor through daisy chaining. 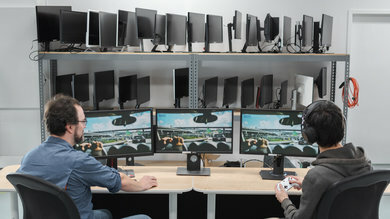 The monitor has a DisplayPort Out for daisy chaining displays, so two monitors can be fed from one DisplayPort on the computer. 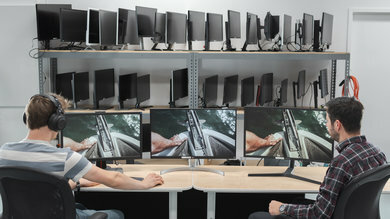 This means that when another monitor is connected to the U2715H, the computer will send video output for both monitors to the U2715H, and the monitor will forward the video for the other monitor out its DisplayPort Out. On the lower right corner of the monitor, there is one power button and four multifunction buttons for navigating the OSD. The buttons are activated by a light touch and have no click feedback, which can take some getting used to. There is an option to make the monitor chirp when the buttons are pressed, which provides feedback but can be annoying. We tested the U2715H, which is a 2015 model 27" Ultrasharp monitor. 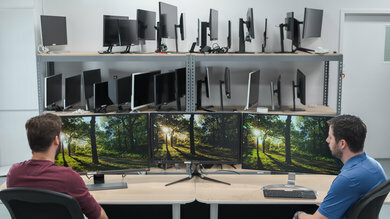 There are many other sizes and year variants of the Dell Ultrasharp monitors, listed below. 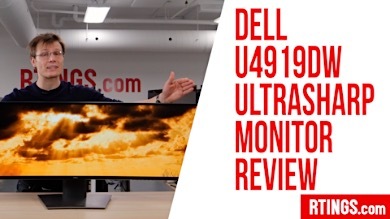 If someone comes across a different type of panel or if their Dell U2715H doesn't correspond to our review, let us know and we will update the review. Note that some tests such as the gray uniformity may vary between individual units. 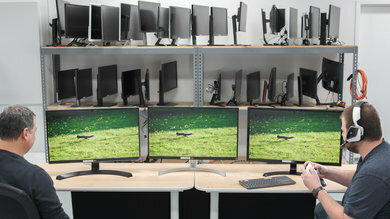 Left: LG 27UD58-B. 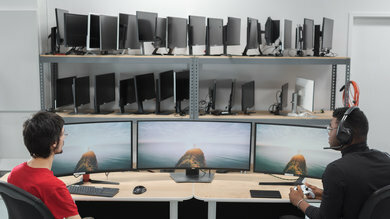 Middle: Dell U2715H. Right: Dell S2716DG. The Dell U2715H is a good monitor for a wide range of usages. 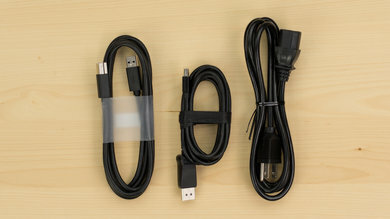 It is quite versatile due to the decent picture quality, low input lag and great response time. 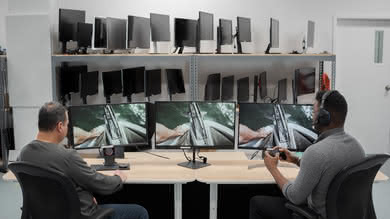 Having said that, for specific usages such as gaming, a more usage-oriented monitor could be a better pick (see our recommendations for the best gaming monitors, the best gaming monitors for PC, and the best monitors for photo editing). The Dell U2715H is better than the Dell U2717D. The U2715 is brighter and has wider viewing angles and slightly better black uniformity, making it a more versatile monitor than the U2717D. The U2715H also has much better input lag, making it a better choice for gaming. 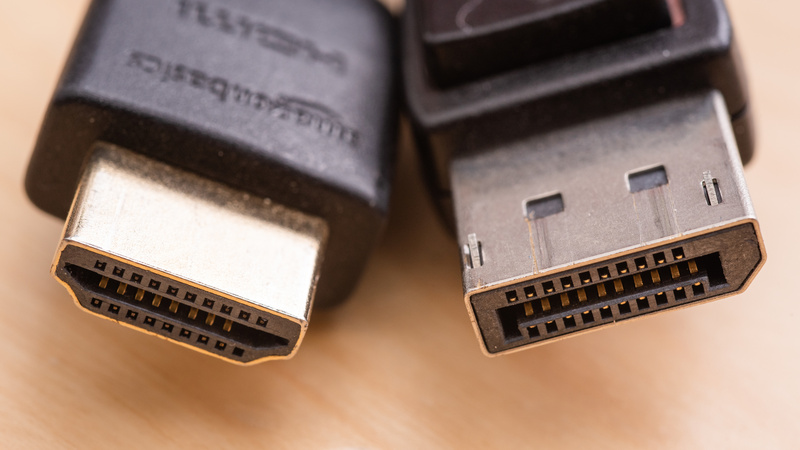 The U2715 has an additional HDMI input, but lacks the side USB inputs found on the Dell U2717D. The Dell U2718Q is better than the Dell U2715H. 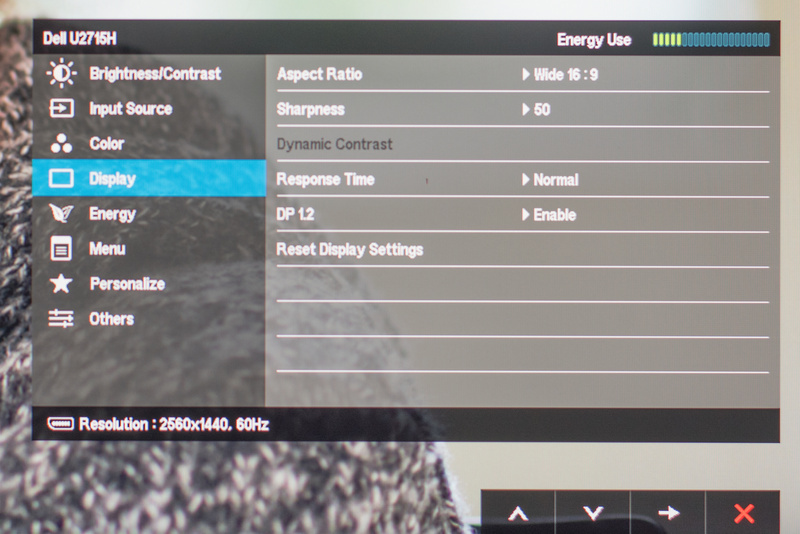 The Dell U2718Q supports HDR and performs decently in that mode. It also has a 4k resolution so you can display more details of your work on the screen. 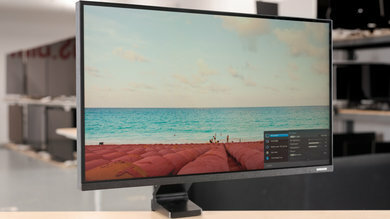 Finally, the Dell U2718Q has a better black uniformity, which is great in dark scenes, and perfect gradient performance with no visible banding. If you will be sitting directly in front of the monitor and your primary usage will be gaming, then get the Dell S2716DG, but for uses where viewing angles are of importance, the Dell U2715H is a better choice. The Dell S2716DG has a faster refresh rate, a lower input lag, and a faster pixel response time that only leaves a small blur trail in fast-moving content. The Dell S2716DG has an option to clear motion blur and make the image crisper by introducing flicker. 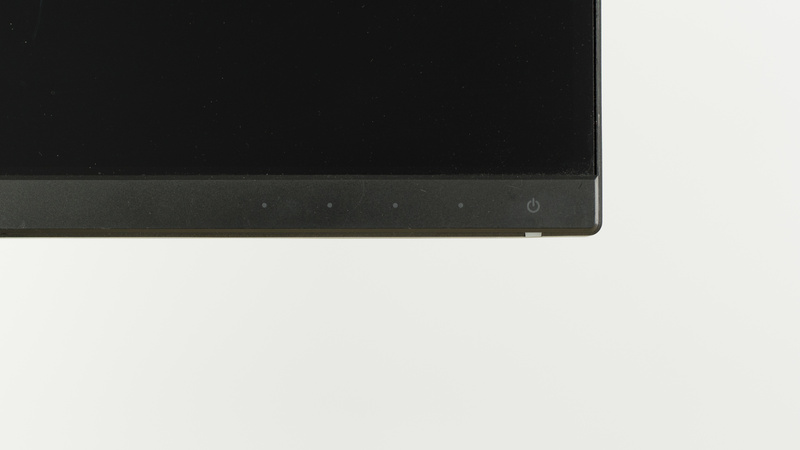 The Dell U2715H, on the other hand, has an IPS panel, and the image remains good at wider angles off the center axis. The Dell U2518D is a bit better than the Dell U2715H. The Dell U2518D has HDR support and performs decently in this mode. On the other hand, the Dell U2715H is slightly larger and has a lower input lag which makes it very responsive which is great for gaming. The Dell U2715H is a bit better than the Dell U2515H due to its larger screen size that allows you to work more comfortably. 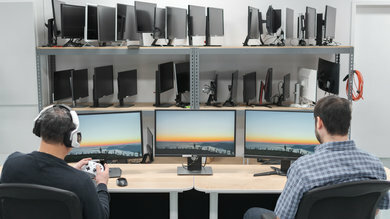 Note that the two monitors have the same resolution. The score differences can be attributed to panel variance. The Dell U2715H is better than the ASUS PB277Q. 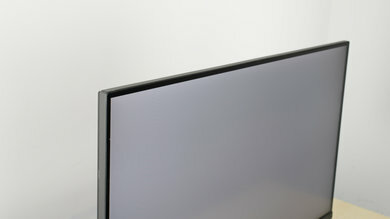 The U2715H uses an IPS panel, which has much wider viewing angles. The U2715H also has better black uniformity, although it still isn't great, this monitor is a better choice than the PB277Q for dark room viewing. 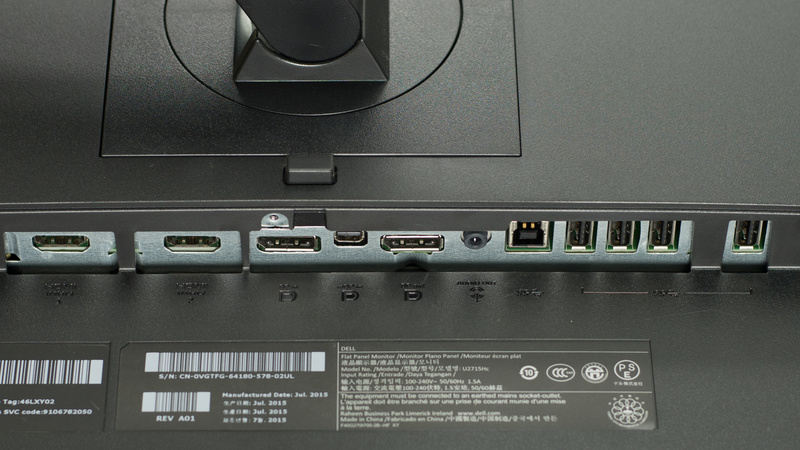 The Dell has a DisplayPort out port, which makes it very easy to chain multiple monitors together if your computer supports it. 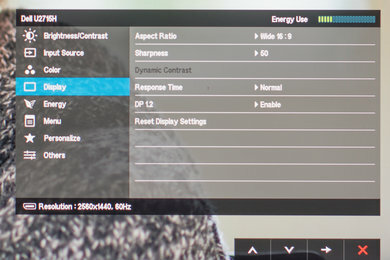 The ASUS PB277Q has a higher native refresh rate, so motion looks a bit smoother. The ASUS ROG PG279Q is much better than the Dell U2715H. The ASUS ROG PG279Q has a faster refresh rate and G-SYNC support which can remove tearing in video games. The ASUS also has lower input lag which makes it very responsive to your actions and supports BFI to make the image crisper in fast-moving content. The Dell U2715H is slightly better than the Dell U3417W. 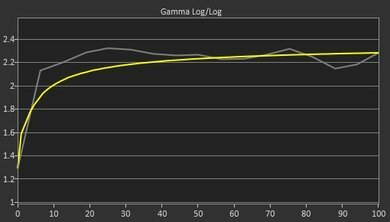 The U2715H is better for gamers as it has much lower input lag. The Dell U3417W is a larger screen with a widescreen aspect ratio and higher native resolution, so it is easier to multitask. The Dell U2715H is marginally better than the BenQ Zowie XL2540, unless your main usage is for gaming. The Dell has a larger IPS screen with a higher native resolution, so you can see more details when working. The Dell has wider viewing angles so the image remains accurate when sitting very close to the screen or if sharing your work with someone else. If your main usage is for gaming, the Zowie has less motion blur, less input lag, and a much faster refresh rate, plus it supports FreeSync VRR. The Dell U2715H is much better than the Samsung UE590. 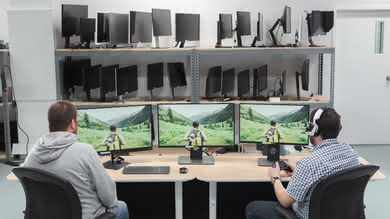 The U2715H has much better viewing angles and better ergonomics, so it can easily be adjusted to the best position and readjusted if there are multiple users. The Dell is better for people sensitive to flicker, as it is flicker-free. The Samsung UE590 is a bit better for gaming, as it has a faster refresh rate with FreeSync support and higher native resolution. The LG 27UD68P-B is marginally better than the Dell U2715H. The LG 27UD68P-B has higher resolution and can display more detail on your screen. The LG also supports FreeSync, which is great if you play video games. 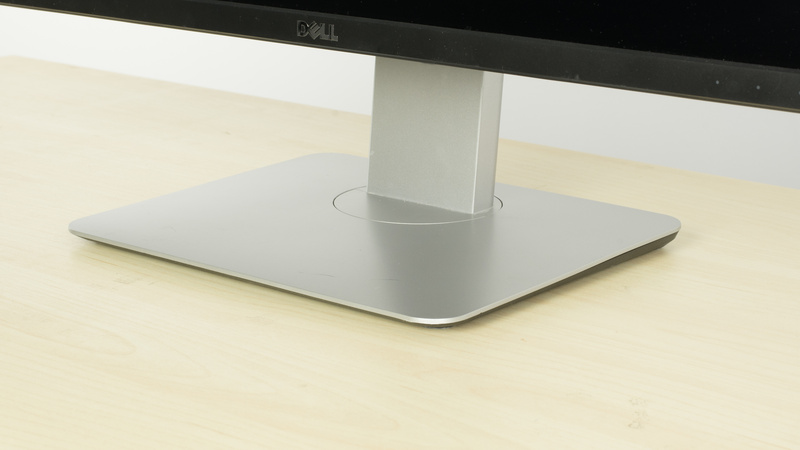 On the other hand, the Dell U2715H has better ergonomics which make it easier to position comfortably. The Dell U2715H is better than the LG 43UD79, unless you want a large screen. 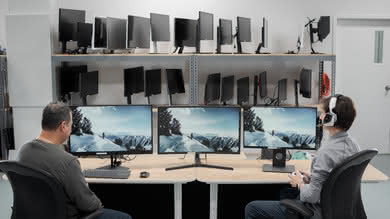 The Dell U2715H has much better ergonomics and can easily be adjusted for an optimal viewing position, great if multiple people will be using the monitor. The LG 43UD79 has a much larger screen and higher native resolution, so you can see more details and it is easier to multitask. The Dell U2715H is much better than the HP V320 for every usage. 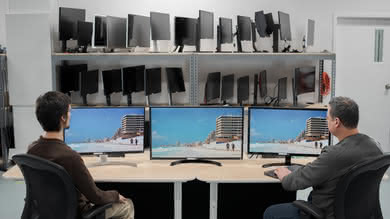 The Dell U2715H has much better ergonomics so you can position it easily as you like. It has higher resolution and can display more details regardless of the smaller screen size. 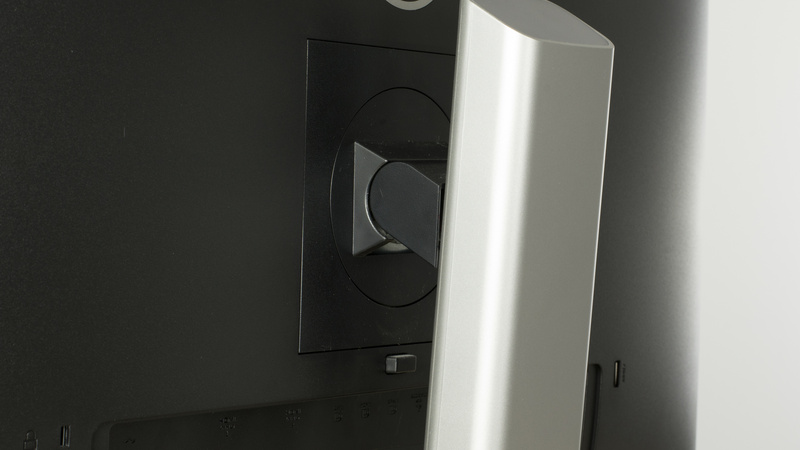 Finally, the Dell U2715H has better reflection handling so you can place it in a brighter room without any issues. The Dell Ultrasharp U2715H is a good monitor for a mixed usage. It gets bright, has decent picture quality and no major flaws. It also comes with a factory calibration that makes it slightly more accurate than average. It does have poor black uniformity though with some backlight bleed, and a higher refresh rate would be an improvement for gaming. 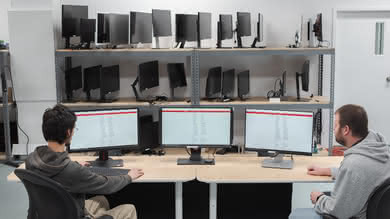 Very good monitor for usage in an office. The wide viewing angle, large working resolution, and great stand remove hassles around productivity and make it easy to share with co-workers on your sides. The picture quality is also decent, and reflection handling is good. The monitor does well as a gaming monitor thanks to its low input lag and motion blur. However, its standard 60 Hz refresh rate and lack of black frame insertion feature make it less interesting for those interested in having the most fluid experience. It also doesn't support any more advanced features such as FreeSync or G-Sync. Decent monitor for consuming a variety of content. The U2517H's accurate colors and great grey uniformity give it a decent overall picture quality, and its better than average resolution allows for content to look sharp. Unfortunately, it doesn't support HDR and its contrast ratio and black uniformity leave a lot to be desired. Better than average monitor for media creation. 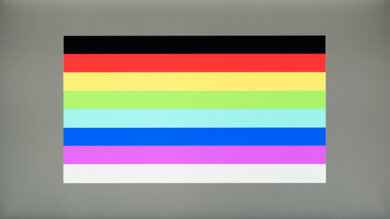 The monitor is sold with a decent factory calibration that makes its colors accurate out of the box. 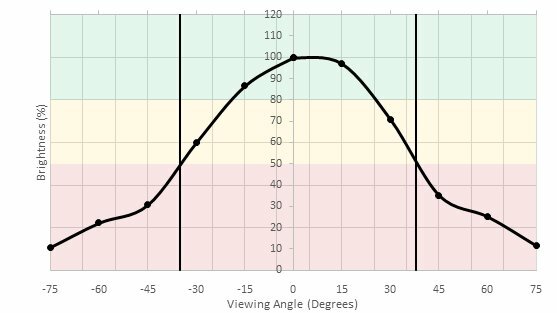 Our unit, however, had minor issues with its gamma tracking and color temperature, and those looking for support of wider gamuts won't be satisfied by the monitor's standard narrow coverage. HDR is not supported. 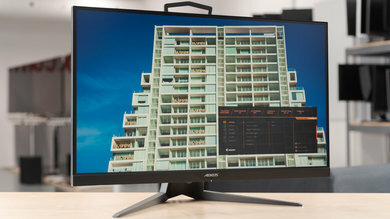 There are only a few HDR compatible monitors at the moment, such as the Samsung CHG70.